WASHINGTONâ€”National Migration Week 2015 will take place January 4â€“10 with the theme, “We are One Family under God.â€� The celebration of National Migration Week provides an opportunity to raise awareness about the hardships faced by migrants, including children, refugees and victims of human trafficking. As part of the 2015 National Migration Week celebration, the USCCB established a small grant program that will provide Catholic parishes, schools and other organizations funding to help them better integrate the Churchâ€™s teaching on migration into new or existing programs, materials, events and other activities. Grant recipients will be announced during National Migration Week. The observance of National Migration Week began over 25 years ago by the U.S. bishops to give Catholics an opportunity to take stock of the wide diversity of peoples in the Church and the ministries serving them. The week serves as both a time for prayer and action to try and ease the struggles of immigrants, migrants and vulnerable populations coming to America and a time for reflection on the Churchâ€™s call to â€œwelcome the stranger.â€� The 2015 National Migration Week marks 50 years of service by USCCB Migration and Refugee Services. Dioceses across the country have planned events for National Migration Week. Masses will be celebrated in Los Angeles; Palm Beach, Florida; San Bernardino, California; Chicago and Miami among others. Forums, vigils, and other special events will take place in Minneapolis; Knoxville, Tennessee; Chicago and Washington. Educational materials and other resources for National Migration Week are available for download atÂ www.usccb.org/nationalmigrationweek. Posters, prayer cards, and booklets can be ordered through the USCCB publishing service atÂ www.usccbpublishing.orgÂ or by calling 800-235-8722. North Dakota must address human trafficking. The North Dakota Catholic Conference supported funding for victim services when the state passed its first set of anti-human trafficking laws, but they were not enacted. Perhaps now is the time. Sign Up for the Advocacy Network Today. State agencies and interim committees have pre-filed 244 bills and resolutions for the legislative session that starts in January. Â Remember: Every bill will get a hearing and floor vote. WASHINGTONâ€”Bishop Eusebio Elizondo, auxiliary bishop of Seattle, chairman of the U.S. Conference of Catholic Bishopsâ€™ Committee on Migration, decried the opening of a 2,400-bed detention center in Dilley, Texas, constructed to house, among others, families fleeing persecution in Central America. The detention center, operated by a private, for-profit group, was inaugurated December 15.
â€œIt is inhumane to house young mothers with children in restrictive detention facilities, as if they are criminals,â€� said Bishop Elizondo December 16. â€œAlready traumatized from their journey, these families are very vulnerable and need care and support, not further emotional and psychological harm.â€� Studies have shown that detention has a harmful psychological impact on children. Bishop Elizondo added that the Obama administrationâ€™s pursuit of a deterrence policyâ€“ including detention and interdictionâ€“ against children and families fleeing violence undermines basic human rights. â€œMany of these families are fleeing persecution and should be afforded the full benefit of domestic and international law,â€� Bishop Elizondo said. â€œAs we saw in the case of Artesia, detention denies mothers and children with valid legal claims meaningful access to due process, including legal representation.â€� A temporary detention facility in Artesia, New Mexico, housing families was recently closed down, in part, because of strong opposition to due process violations and conditions there, especially for children. The average age of children detained in Artesia was six and a half years old. Bishop Elizondo added that humane alternatives to detention exist, particularly community-based alternatives based on a case management model. Activities like Holy Bowling take place year round but its main event is the program it offers every summer at Camp Ronald McDonald near Eagle Lake in Northern California. Campers are assigned their own counselor for the week, who accompany them to meals and activities, stay with them in their tent at night and see to their personal needs. “This relieves a lot of the anxiety and homesickness the campers might otherwise feel, being away from their families,” says Kathi Barber, the program director in Sacramento. Originally there were two sessions in June, but demand was so great that a third was added. The Diocese of Orange also operates a Camp ReCreation – founded in 1978. Both camps operate in much the same way and are under the auspices of their local diocese. Each also relies on private donations, various grants and fundraising by the Knights of Columbus. According to Kristan Schlichte, senior director of membership for Catholic Charities USA in Alexandria, Virginia, both camps are based on a model used by the Sisters of St. Francis in Milwaukee, Wisconsin, who have been serving the developmentally disabled since 1904. “They are viewed as leaders in special religious education,” Schlichte says, and explains that the program has a three-fold focus – respite care, recreation, and religious education. Carol Metz, a special education teacher for San Juan Unified school district, explains that under California state law, special-needs students can remain in the public school system until the age of 22 and then they are transitioned out. “Camp ReCreation is a strong program, and is recommended by different social service agencies because they know the world gets smaller for many of these people when they transition out of school,” she explains. And the benefits aren’t one-way. “People get into this,” she refers to the volunteers, “thinking that they’re doing something good for someone else. Then they realize they’re getting more out of it than they were giving. All of these titles are true and richly deserved. But they can sometimes obscure the human reality of Mary’s life: a young woman of the rough Galilean hills, pregnant, with a seemingly implausible story before her marriage to Joseph, who gave birth to her child in the cold in a stable far from home and then, hunted by Herod, was forced to flee to Egypt. Mary - ourmother; the mother of the Church – had an intimate understanding of suffering, flight, homelessness and uncertainty. At Guadalupe, Mary appeared not to the rich or powerful, or even to the local bishop, but to the poor peasant Juan Diego. Her tenderness to the poor is something we need to remember this Advent, because our Christian faith is more than a set of ideas or beautiful words. It’s meant to be lived. It’s meant to transform our thinking and our actions. Check out thisÂ two-page handoutÂ for a summary of the message and prayer and action ideas! Photo of Pope Francis by Paul Haring of Catholic News Service. Read the entire CNS article here. 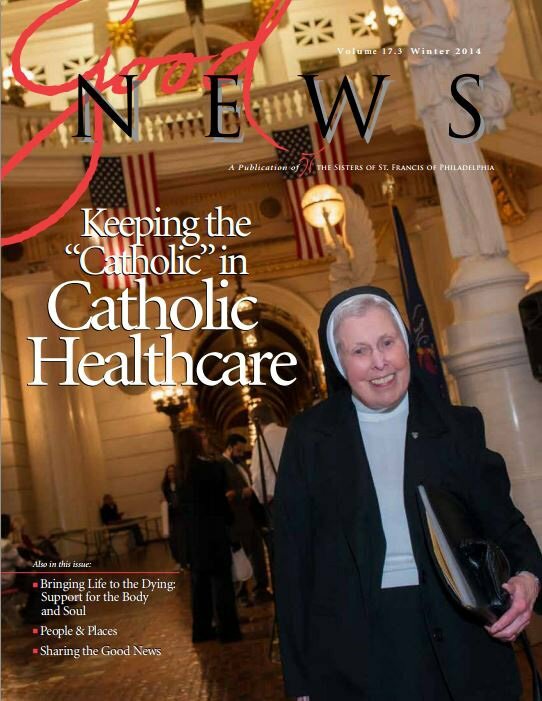 Sr. Clare Christi Schiefer, O.S.F., president of the Pennsylvania Catholic Health Association (PCHA), was recently profiled in Good News Magazine, a publication of the Sisters of St. Francis of Philadelphia. Many people reacted to the headline, without examining the entirety of the Pope’s challenge to the world, says Bishop Robert McElroy, auxiliary bishop of San Francisco. The Bishop summarized that challenge in a simple way: how do we recognize and help the Lazarus’ of our day? The cry of the poor captured in “The Joy of the Gospel” is a challenge to the “individualistic, indifferent and self-centered mentality” so prevalent in the cultures of the world; it is a call to confront the evil of economic exclusion and begin a process of structural reform that will lead to inclusion rather than marginalization. Unfortunately, in today’s world of extreme polarization, creating those structural pathways out of poverty is caught up in partisanship and extreme politicking. Catholic social teaching urges a balance. It stresses the value of caring for the poor and the need to provide for ourselves and our families and a balance between dependence and independence. With the Census showing that California’s poverty rate is now at 14.9 percent in 2013 – higher than the 12.2 percent, pre-Great Recession– it is incumbent upon Californians to examine and strengthen effective pathways out of poverty. Notice some of the nuances that are sadly lacking from political debate today. The responsibility is both communal and personal. Use the best information available. Times can change; we should constantly re-evaluate. And keep working toward the good. Just a thought, but by bringing these principals to a public policy discussion instead of “debating” based on bumper stickers, political agendas, rhetorical slams and news headlines might just lead to results that are much more beneficial to all of us. 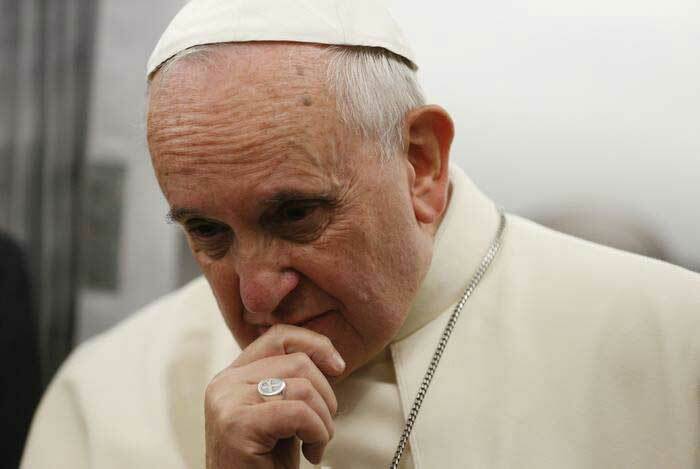 2014-07-16 – Pope Francis: Why are we surprised people flee violence and poverty? Christmas is a time for celebration, but it also a time for helping those in need. 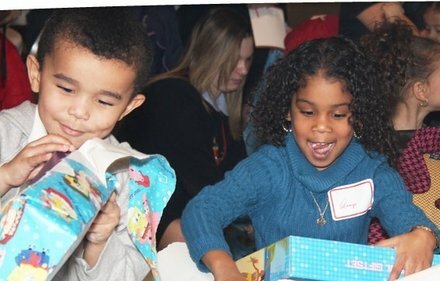 Since 1955, the Archbishop’s Christmas Benefit for Children has supported programs at Catholic Social Services that directly benefit children in poverty, at-risk youth and children living with special needs in the Philadelphia region. Today, the annual appeal raises thousands of dollars to fund dozens of programs helping more than 16,000 children from all faiths throughout the Archdiocese of Philadelphia. Ernie is one of those children. When he found himself in trouble with the law, Ernie and his family feared that he would face prison. Instead, he was placed at St. Gabriel’s Hall, a residential program for adolescents operated by Catholic Social Services. He is now working toward his diploma and learning social and vocational skills. In addition to St. Gabriel’s Hall, the Archbishop’s Christmas Benefit for Children helps support after-school programs, programs to strengthen families, pre-school for low-income Hispanic and Latino children, prenatal outreach to expecting mothers, summer job training for high school students and residential housing for people with developmental disabilities. Every December, the Archbishop’s Christmas Benefit for Children invites 400 children to a Christmas celebration. The children participate in a number of festive activities including a Christmas pageant, holiday treats and wrapped presents delivered by Santa and his elves. For many of the children, the experience of joy and love means more than the presents. Catholic Social Services in Philadelphia is one of several diocesan Catholic charities in Pennsylvania. Collectively, Catholic charities in the Commonwealth serve over 500,000 Pennsylvanians every year in rural, urban and suburban areas, including youth services, health care, homeless shelters and soup kitchens, residential options, family counseling and adoption and foster care services. No matter one’s religion, race, gender or ability to pay, Catholic charities help those in need at more than 375 locations across the state. For more information on the Archbishop’s Christmas Benefit for Children visit www.archbishopschristmasbenefit.org. Grant your faithful, we pray, almighty God, the resolve to run forth to meet your Christ. Members of society contribute to the common good through their generous use of the spiritual, social, or material means they possess for the good of others and to create conditions that allow people to more easily live a humane existence. The Pennsylvania Catholic Conference advocates for public policies that improve the conditions for people to thrive. Its mission is to formulate positions on issues, officially represent the Church before state government, and to foster a public understanding of the Church’s teaching and concern about morality, health, welfare, human rights, education, and yes, the common good. The PCC is an authoritative resource for the Catholics and a vehicle for change. Our website, www.pacatholic.org, is a place for citizens to seek the truth about perplexing societal questions and find links to the Catholic Advocacy Network’s tools for urging our elected officials to vote in support of the common good. The political challenges that face our nation, our state, and our cities and towns demand urgent moral choices on behalf of all citizens. Pray, inform your conscience, speak up for the common good, and be generous with your spiritual, social, or material means. As we run forth to meet our Christ, let’s look for Jesus around us and work toward improving our society for all of God’s children to achieve the happy and healthy existence they deserve. DECEMBER 2014 Column from the Pennsylvania Catholic Conference – the public affairs agency of Pennsylvania’s Catholic bishops and the Catholic dioceses of Pennsylvania. Stay up-to-date with Catholic news and issues at www.pacatholic.org, www.facebook.com/pacatholic, and www.twitter.com/pacatholic. (En Español) During 2015, the Year of Consecrated Life, the Bishops of California join with Pope Francis and the worldwide Catholic Church in honoring the women and men who fulfill their baptismal vocation by formally consecrating their lives to service, prayer and care for others. The sisters, brothers and priests in contemplative communities, apostolic institutes and religious orders are a gift to us all. They are a living example of discipleship by their commitment to Christ, holiness, and compassionate service to others. They daily bring the joyful Gospel message to our world. Their fidelity to the vows of poverty, chastity and obedience enriches the life of the Church. Various religious orders of women and men have long graced California with their unique charisms and courageous missionary zeal. With a heartfelt devotion to the people of California and with a particular concern for the poor and immigrants, they have built schools, hospitals, social services, missions, children’s homes and other institutions to address the needs of our communities. In doing so, they helped build the virtue and vitality of the Golden State. Hospitals founded by communities such as the Sisters of Mercy, Sisters of St. Joseph’s of Orange, Providence and the Sisters of the Little Company of Mary are still thriving. Catholic health systems and independent hospitals comprise nearly one in five hospitals in California. Great universities across California – sponsored by religious men and women – continue to graduate thousands of men and women who give shape to our society in business, the arts, politics, science and other fields. Religious orders like the Christian Brothers, Sisters of Providence and Salesians operate outstanding high schools and primary schools serving generations of families. And countless charitable and pastoral ministries were birthed and flourished – meal programs, youth groups, bible studies, migrant ministries, counseling centers, spiritual direction and more. Many of these apostolates are still coordinated by sisters and other religious. They invigorate and animate our parishes. This noble history continues. California and the Church are still benefitting from many new religious orders founded here and elsewhere in the world. As in the past, religious men and women from all over the globe bring the richness and power of their faith to this State. At the heart of all that is done are the lives of women and men who have given themselves to Lord Jesus. They have chosen to know, love, and serve him in their fellow Californians. These lives aflame with the wisdom and charity of Christ are what bring hope and joy to the work of the Church in this State. A special note of gratitude goes to the families, the domestic church. They have generously given their children to the saving mission of the Church. Families support and encourage their children to follow Jesus. To this day some have chosen to do so along the path of a consecrated life. As the Universal Church examines how to better evangelize families in the midst of tremendous societal changes, we should celebrate the role of the families in nurturing vocations for the good of the Church as well as society. Special celebrations and events are planned by the Church around the world and California during 2015. Each diocese is blessed with religious communities of women and men who are an integral part of the life of the local church. This partnership will be savored and celebrated in the coming year. Each of us can also offer our prayers of thanksgiving and ask God’s blessings upon our sisters and brothers living a consecrated life. We can also learn about religious communities near us, visit a monastery or cloistered community, examine the consecrated life through parish activities or visit with elderly sisters, brothers or priests. Even though many religious have retired from active ministry, their faithful prayers and sacrifices still sustain the mission of Jesus. Note: Additional information on the consecrated life is available at www.cacatholic.org and a prayer in both English and Spanish is available atwww.usccb.org. A special touring exhibit on the impact of women religious in California is available at http://womenandspiritcaliforniaonline.com/. The website for the special touring exhibit is: http://womenandspiritcalifornia.com/. And more on communities of religious men can be found at the Conference of the Major Superiors of Men – http://www.cmsm.org/. Mr. Michael Ballard had been scheduled for execution on December 2, but a judge has granted him a stay. While Northampton County Judge Emil Giordano declared Michael Ballard competent to make the decision to stop appealing his death sentence, Judge Giordano also granted Mr. Ballard’s request to stay his execution. Mr. Ballard’s apparent contradictory requests to not appeal his death sentence and his request for a stay are rooted in the distinction he makes between on the one hand accepting his death sentence and waiving his post-conviction appeals, and, on the other hand, not wanting to be tortured to death by the state. Many recent examples of botched executions in other states reveal the brutality of the death penalty. Mr. Ballard is now a plaintiff in two separate cases contesting the constitutionality of Pennsylvania’s execution procedures. Send a message to elected officials asking them to uphold a culture of life here. On August 22, the California Department of Managed Health Care (DMHC) ordered all health plans under its jurisdiction, including those provided by churches and other religious institutions to their employees, to provide coverage for all abortions. The order includes abortions at any stage and for any reason, because (says the DMHC) killing unborn children is “a basic health care service.” Other states are considering similar proposals. California’s action violates federal law. The Weldon Amendment, a part of appropriations law since 2004, provides that governmental bodies receiving federal funding may not discriminate against a health care entity that “does not provide, pay for, provide coverage of, or refer for abortions.” But Weldon lacks effective enforcement and has been subject to legal challenges. To strengthen its protection, Congress should pass the Abortion Non-Discrimination Act (ANDA) as part of must-pass funding legislation at the earliest possible opportunity. For a letter to Congress from the U.S. bishops on this matter, see: www.usccb.org/news/2014/14-192.cfm. â€œWe have a long history of welcoming and aiding the poor, the outcast, the immigrant, and the disadvantaged. Each day, the Catholic Church in the United States, in her social service agencies, hospitals, schools, and parishes, witnesses the human consequences of the separation of families, when parents are deported from their children or spouses from each other. Weâ€™ve been on record asking the Administration to do everything within its legitimate authority to bring relief and justice to our immigrant brothers and sisters. As pastors, we welcome any efforts within these limits that protect individuals and protect and reunite families and vulnerable children,â€� said Bishop Elizondo. From the USCCB—Bishop Eusebio Elizondo, M.Sp.S., auxiliary bishop of Seattle and chairman of the U.S. Conference of Catholic Bishops (USCCB) Committee on Migration, welcomed the news today that the Obama administration will defer deportations for many undocumented immigrants and their families. “We have a long history of welcoming and aiding the poor, the outcast, the immigrant, and the disadvantaged. Each day, the Catholic Church in the United States, in her social service agencies, hospitals, schools, and parishes, witnesses the human consequences of the separation of families, when parents are deported from their children or spouses from each other. We’ve been on record asking the Administration to do everything within its legitimate authority to bring relief and justice to our immigrant brothers and sisters. As pastors, we welcome any efforts within these limits that protect individuals and protect and reunite families and vulnerable children,” said Bishop Elizondo. “Comprehensive immigration reform is long overdue in the United States. The Bishops of California welcome the President’s action to offer some humanitarian relief for hard-working families who have lived in the shadows for too long. “As pastors we witness firsthand the needless strain and pain the broken immigration system has inflicted on our communities. Respect for human life and dignity demands that our national leaders put people before politics. They should reform the immigration system, adhering to the traditional, sound principals of U.S. immigration: family unity, proper protection of our borders, and addressing the root cause of forced migration. An essential part of the solution should include a legalization program with an earned path to citizenship. “We acknowledge that many will find some hope and peace-of-mind by this action. Parents and children will no longer live in fear of being separated. Growers and other employers will know their valued, productive employees are safe. Law enforcement will be able to work more closely with immigrant families to ensure the safety and tranquility of their communities. As we have done for many years through our Catholic Charities and other partners, we will continue to assist them in obtaining the benefits provided by law. “We advise caution and patience while the details of the President’s order are carefully evaluated. With time, we will understand how the order will be implemented. Be wary of any unscrupulous attempts to exploit unsuspecting immigrants by offering quick solutions. November is National Adoption Month, and no family is happier to celebrate it than the Roush family. 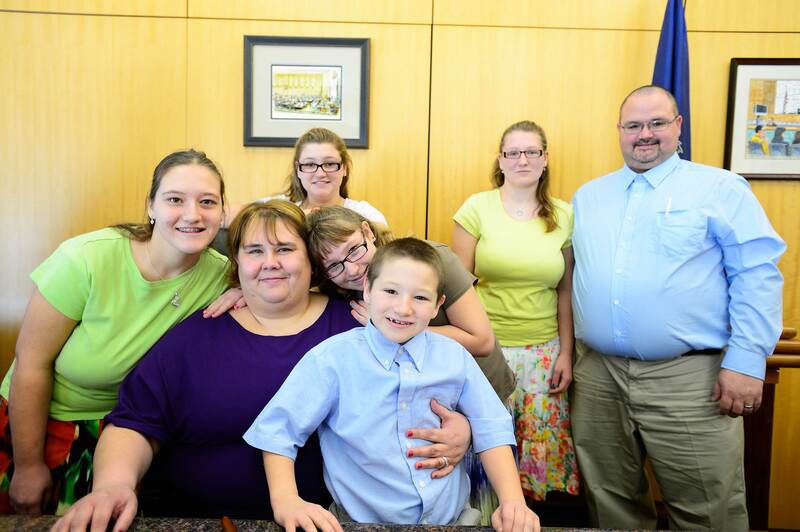 On November 18, the siblings, ranging in age from 7 to 16, will be adopted by their aunt and uncle in Dauphin County in Harrisburg, Pennsylvania. The adoption has been facilitated by Catholic Charities of the Diocese of Harrisburg. “We have been blessed by these five children. The children have brought such joy, not only to us, but to our whole family. We are so excited to finally be a forever family. They filled a space in our hearts we always knew was empty,” said Mr. and Mrs. Roush. The family has partnered with Catholic Charities to make this dream a reality. Catholic Charities Adoption Services of Diocese of Harrisburg serves 15 counties in Central Pennsylvania. Opened in 1938, Catholic Charities Adoption Services has assisted birthparents, adoptive families and children, treating every person with love and acceptance. “The social workers at Catholic Charities have been working with the Roush family for over 2 years. Our caseworkers have prepared the children for permanent placement with a family over many sessions. We created their family profile, which certifies the Roush family for adoption, and we completed the children’s profiles, which are required by the Department of Public Welfare. And we are very pleased to be completing the process by finalizing the adoption with Judge Hoover,” said Kelly Bolton, MSW, LSW, the Program Director for Catholic Charities Adoption Services. Not only does this happy moment come during National Adoption Month, this is also the largest group adoption ever completed by Catholic Charities of the Diocese of Harrisburg. For more information about the adoption program at the Diocese of Harrisburg, visit here. For information about adoption in other parts of the state, visit www.adoptionpa.org. 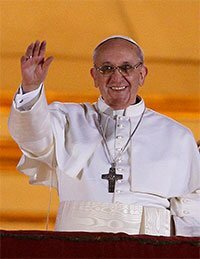 In remarks offered today in Rome, Pope Francis formally announced his intention to attend the World Meeting of Families – Philadelphia 2015, set to be held September 22-27, 2015. This visit will mark his first to the United States as pope. He will be only the fourth reigning Pontiff to visit our nation in its history.